This Victorian weatherboard house puts you in easy reach of the city and Salamanca Place, a fully self-contained property you will find everything you need for a comfortable stay - kitchen, laundry, living room with wood heater, dining room, one king size bedroom and the second with a double and a single bed. Enjoy the beautiful garden from the deck, pick your own greens and herbs or catch a view of the mountain from the front verandah in the late day sun. There is also an attic retreat for reading or relaxing, which offers a great view of the harbour. Free Wi-Fi is available and a telephone for local calls is provided. "We all enjoyed staying at Top House over the recent long weekend. As we had visitors from the UK, I was after a place that gave an idea of the architecture of an era. The house was very comfortable and had all that we needed. House has a lovely aspect and great views and its close enough to down town to walk down and catch a bus back up. I'd recommend the place warmly." West Hobart is on old, established suburb of Hobart with beautiful heritage houses and lovely gardens. Centrally located, it is a few minutes drive from restaurants in North Hobart, Salamanca Place or Sandy Bay. There are also two fabulous neighbourhood restaurants, Paesano Pizza and Pasta, for Italian food and Smolt Kitchen a Bistro for all day dining. Lansdowne Cafe a little further around the Crescent for breakfast or lunch. An excellent corner shop/post office provides all your daily needs and there is a bus stop right outside their door with frequent service. Hill St Grocer for fresh fruit and veg and gourmet products, an award winning butcher and an Amcal pharmacy are just 2 blocks away and a very popular secure children's playground, known as the train park is just a block away. From Hobart you can make day trips to historic Richmond, Port Arthur and the Tasman Peninsula, the Huon Valley, New Norfolk and Mt Field in the Derwent Valley and also the historic towns of Ross and Oatlands in the Southern Midlands. 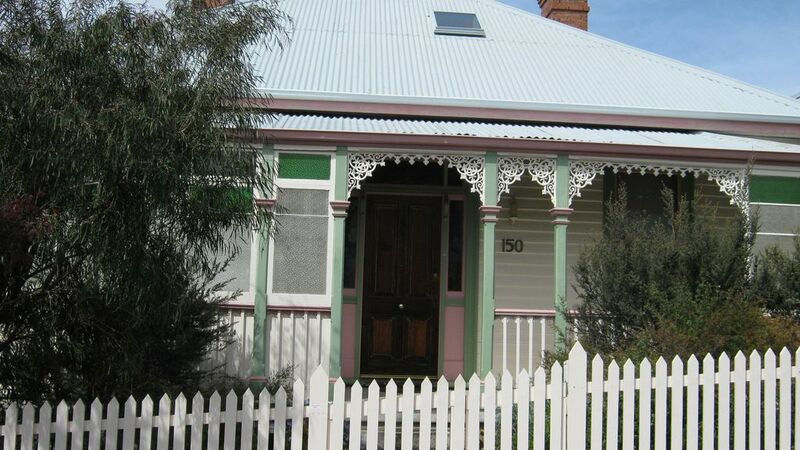 A heritage cottage in a lovely area of Hobart that harks back to our grandparents era without losing the modern day conveniences that we now take for granted. Secure, easy entry on arrival, with rapid response from owners to any queries. Fresh flowers in every room great you on arrival, and there are many thoughtful pantry and homely extras that make your family stay here much easier. The house is readily warmed with instant heaters or a wood fireplace in the lounge. Curios from "the olden days" are displayed around the cottage, and there is a lovely back garden with harbour glimpses. The lounge room bay window is a lovely morning sun trap from where you can fully stretch out and plan your day from the provided up-to-date tourist brochures. There is a creaky wooden staircase to the upper rooms that fires kids "Harry Potter" imaginings. Lovely views from upstairs but largely an undeveloped area of the house. The driveway allows parking for one vehicle, though it is a tight squeeze for an SUV. There is plenty of free on-street parking, though this is on a steep slope. Easy downhill walking distance to town - but very steep. You'll have to stop and admire the views and beautiful neighbouring houses several times on your way home unless vertical is usual for you! Quiet and peaceful location despite commercial neighbours. Typical of its era, this house has many changing floor levels within, and front access is via a charming but narrow and uneven stone path. Large steps at the front, and lack of hand rails may prove challenging to some guests. The very low toilet and the step-in shower have no grab rails and may not be suitable for all guests. A wonderful holiday home provided by thoughtful owners. Lovely, cosy house. All old world charm so felt like I was visiting my grandparents. Clean and all possible needs catered for. Lovely to have a nice backyard to spend time in. This older style property was well appointed by host. It is spacious so a good home from home all to yourself. Generous provisions of basics in pantry. Beds were very comfortable so good nights sleep which is important. Quite a quiet location. Great Italian Restaurant very close by. Walk into town was about 25 mins to Salamanca but all down hill. The hills were good for fitness on the way back up! A taxi was only $8 if you struggle. Nice garden at back but needs a bit of TLC. My only comment would be the dust as a lot of old soft furnishing and lace, which can be an issue if you have allergies. A coat of light paint inside would brighten it up to a new level. A beautiful character home in the heart of Hobart. Clean, tidy and all facilities provided. Great location. Lovely garden and view. The owners went out of their way to make us feel welcome. A wonderful house for a family stay in Hobart. Great sized house with a fantastic yard for the children. A wonderfully relaxing satu. We really enjoyed staying here. The back terrace was a nice place to have a relaxing glass of local wine. Close to downtown, Salamanca and Battery Point. All the amenities we needed with local shops. Would love to stay here again!